Today we’d like to introduce you to Prashant Shah. I first discovered my musical talent in my Hoffman High School’s Indian Cultural Show. I participated to play the piano. A friend of mine, Mithun Tangutoori, decided to sing along with my instrument and we did our first collaboration Hindi song live in front of our High School and received an amazing response. We knew we had found our niche. Over the next few years we created a band with Tabla players, Dhol Players, Bass Guitarist, Female vocalist and me on the keyboards. The largest event we performed at was a Navratri Garba with actress Karisma Kapoor, which was sold out at 4,000 guests. I went to Columbia College, Downtown and completed my bachelor’s degree in Sound Engineering. I ran a 24 Track Pro-Tools recording studio, recording Indian artist as well as local American Pop and Hip-Hop artists. One highlight was being able to host Zee TV’s Sa Re Ga Ma Pa auditions at my recording studio where I had the opportunity to work with some of the best Indian singers from around the country. Having a passion for music it was natural for me to enter into the Indian Wedding scene as a DJ. The past 10 years I have been performing at Indian Weddings that consist of a Sangeet, Mehndi, Baarat, Wedding and Reception. In 2016 my team successfully completed over 100 events and I started this year by being named 2017 Wedding Wire Couple’s Choice Award Winner. There is no such thing as a smooth road, and if you feel it’s smooth that means you are not pushing yourself to your maximum potential When you are passionate about something you really don’t look at anything as a struggle but an opportunity to learn and improve. Alright – so let’s talk business. Tell us about DJ Prashant – Indian DJ in Chicago – what should we know? 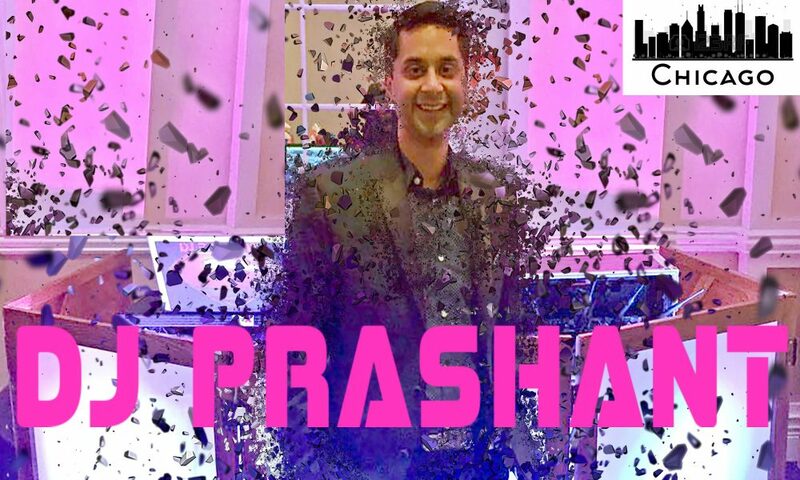 DJ Prashant is an Indian DJ, Lighting, Event Production and Planning Company catering to Indian, South Indian and Pakistani Weddings, private & corporate events in all of Chicago, Milwaukee and Indiana. I specialize in creating perfect ambience and lasting memories with music, sound and lighting. DJ Prashant is Chicago’s Premiere Indian Wedding DJ, Lighting, Entertainment and Event Production / Planning Company with over 19 years of experience. DJ’s here have served South Asian Indian, Pakistani (Desi) and Mixed Wedding Events, Corporate events, Private Events and Ethnic events of all kinds in Chicago with great success. DJ Prashant offers professional Entertainers, DJs, Dhol Players, state-of-the-art Sound System & Lighting with special effects, AV, PA system and much more. DJ Prashant is located in Schaumburg, IL and the Chicago area and is currently serving all of Chicago, Milwaukee and Indiana. DJ Prashant offers services for Weddings, Baraat, Receptions, Pre Wedding Events, Birthdays, Graduations, Anniversaries, private & Corporate Events and any other special occasion you might be celebrating. Our music collection consist of Hindi Bollywood, Bhangra, Hip Hop, Telgu, Tamil, Pop, Disco, Dance, DubStep, Rock, Jazz, Arabic, Latin music, Indian and Western Classical, and much more. The entire Indian Wedding scene from all of the banquet hall managers, to all the other local Indian DJ’s have been supporters and advocates. We are not only competitors but friends and I would not be where I am today if it were not for them paving the way and setting the bar higher and higher for Indian weddings in Chicago.